Wish you all a very happy new year 2016. There was a time when Ishaan was around 2 years of age when I used sweet potatoes very regularly. But that did not continue for a long time. He does not like anything sweetish, so I stopped. Now I am trying to include them back in our diet because of their nutritional values and also because Ayaan is almost that age now. He has a big sweet tooth. Few months back, I saw these very tender and beautiful sweet potatoes at Farmers market. I made a simple stir fry with half of them. 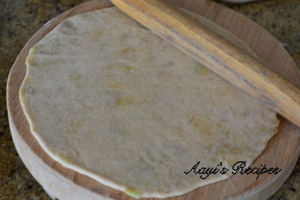 The remaining went into these stuffed parathas. I used a combination of sweet potatoes and normal potatoes for this. I did not want the parathas to be too sweet. 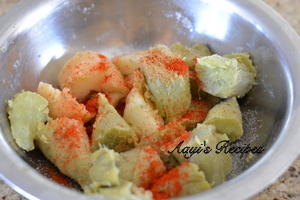 I also used lot of masalas to make them a little spicy. I think I need to make these more often, they were just delicious. 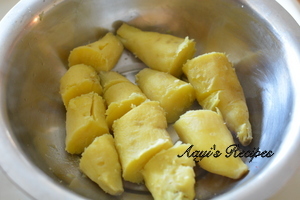 Cook sweet potatoes and potatoes(I do not have them in picture below) in pressure cooker. Peel them when they are cooled down. Add the spices and mash them to remove any lumps. Make the dough. Take small balls of covering, flatten it on the palm and then stuff a small ball of stuffing in them. Seal properly. Roll each ball and then roast them on tava. 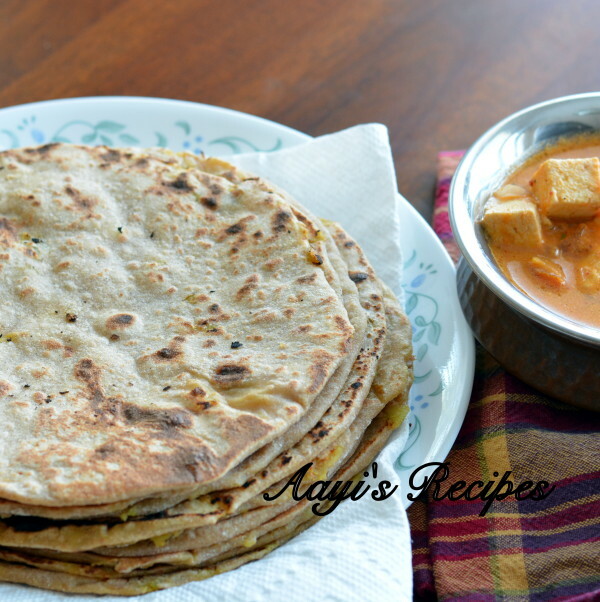 Sweetish spicy parathas with sweet potatoes, tasty and very filling. 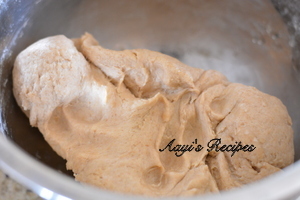 Make a dough with the ingredients mentioned under outer cover. Knead the dough very well for few minutes. Apply little oil to the dough and let it rest (covered) for atleast 30-60mins. 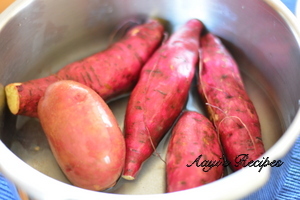 Cook sweet potatoes and potatoes in pressure cooker. Add all the spices, salt and mix well. Make small balls out of the dough and stuffing (I usually make sure I have equal number of dough and stuffing). Take a ball of dough and flatten on your palm, use little oil if needed. 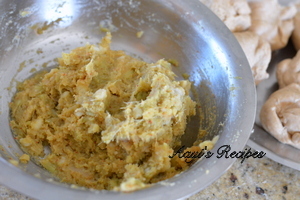 Keep a stuffing ball on it and seal the dough properly around the stuffing. Roll them into paratha. (Do not use too much dry flour). Apply ghee from both sides for extra taste (I do that for kids). Serve hot with yogurt or pickle or any side dish of your choice. How many whistles in pressure cooker are needed to cook sweet potatoes? Looks yummy and appetisig.. My ggrandson 16 mmonth months old is a fussy eater.. Will tell my wife to try this on. Any suggestions for fussy kids. Please llet me know. 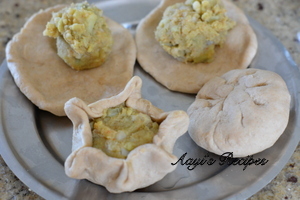 I have few kid friendly recipes on this site, please try. 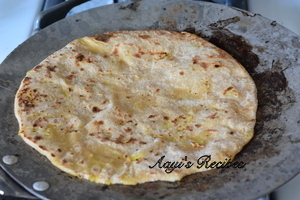 this was looking one of the best potato Parathas full with potato. A breakfast that i make often and for years now. have becoming a sort of expert in making parathas. 😉 Thanks for sharing this recipe. I will definitely give a try it. I really liked your idea of using both regular & sweet potato. My kid ate without fussing. You deserve a pat on the back! Tasty and healthy recipes for morning breakfast. I try to made it at house and really it is very tasty and delicious.